In this week’s discussion we talked about anxiety - a feeling of worry, nervousness or unease about something with an uncertain outcome. A diagnosis of breast cancer brings with it huge fears and uncertainty: women with primary breast cancer are faced with the fear of recurrence; women with secondary breast cancer are faced with the fear of progression. Regular checks and scans remind us of our vulnerability, every ache and pain causes worry that ‘it’s back’ or has spread further. The threat to life that cancer represents is ever present and anxiety becomes the background music of our lives. 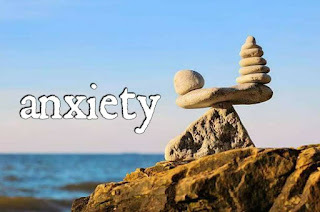 Anyone who has struggled with anxiety knows how debilitating it can be, and if we are someone who has always struggled with anxiety, our mental state becomes one of heightened anxiety. It is exhausting. Sometimes we recognise and face our feelings, sometimes we cut off from them and yet we experience a subconscious reaction to a perceived threat, whether real or imagined. Anxiety is as real as a post-traumatic stress and as we know, a breast cancer diagnosis is a traumatic event in our lives. Many of us had experienced anxiety all our lives. For some, the discussion itself highlighted how anxious we feel. Some of us could accurately describe the physical sensations of anxiety within our bodies. Some described pushing away anxiety with distractions, such as keeping busy. Some tried to embrace the worry and accept it, whilst striving to let it be. A few of us described panic attacks, others a continuous underlying feeling that something awful about to happen. Physical symptoms included heart palpitations, shortness of breath, sweating and nausea. Some of us worry about every little thing. Others no longer ‘sweat the small stuff.’ Most of us experience extreme anxiety around the times of scans and anniversaries. For some, anxiety is so high that it interferes not only with our hopes and dreams but day to day activities. Our advice to anyone in this position is to seek professional help. Naz explained the way the brain adapts to persistent fear, preparing the body to expect danger and meet it, triggering the primitive flight or fight response - to run, to fight, or perhaps freeze. We are, by default, vigilant. She used the image of a see-saw to explain the way the cognitive and emotional brain systems interact. At one end of the see-saw, in an anxious state, the emotional system dominates and weighs us down. At the other end of the see-saw, the cognitive system lets go in order to prevent becoming overwhelmed. Resilience can strengthen the cognitive system to gain weight as it moves towards calm and rational thought, allowing the see-saw to swing back into balance. This is not about numbing, controlling or avoiding, but a robustness which promotes neural plasticity and supports good communication between the cognitive and the emotional brain systems. Resilience helps us to bring flexibility to the see-saw. It is a key adaptive factor in coping, indeed to survival, and Naz’s research is highlighting the possibility of building a ‘cognitive vaccine’ to protect against the damaging effects of anxiety. We shared our coping strategies: mindfulness and meditation, deep breathing, practising realigning thinking by keeping an emotional diary, simplifying our life by reducing responsibilities where possible, taking time for ourselves and practising self-compassion and self-soothing. Hobbies, exercising and being outdoors and in nature can also help. One suggestion was to focus the attention on something else – drinking a cool glass of water through a straw with closed eyes. Another was to embrace our anxiety as one would comfort a fretful child. A question was whether breast cancer had caused or heightened our anxiety because we face our mortality or whether, because it leads to a change in our values, an increased sense of what’s important to us in our lives. Letting go of things that are no longer important and discovering who are in the aftermath brings another set of challenges. We are changed by cancer. We can never ‘get over’ it. We can learn to live alongside it in some sort of harmony, with the see-saw constantly moving, but gently tilting back towards equilibrium as we practice self-care.